When you first purchase a telescope, it usually comes with standard optics that don’t immediately require additional optics right off the bat. Compared to cameras, which are regularly updated along with a specific line, telescope manufacturers take greater time to produce new models with different features and capabilities. Particular models will have the same manufacturer, they don’t operate along a particular “line” of products like cameras, binoculars, or other optics do. All telescopes are made to see the stars, but some have limits as to how far and what they can see. Any two telescopes will differ on power and quality of view based on the size and quality of their optics. However, if you take a good look at two or more telescopes, you’ll probably notice that most have similar mounts, tripods, viewfinders, and so on. Here are examples of telescope accessories we think you should be familiar with in the case that something breaks or needs replacing. Eyepieces are going to be your primary investment. They will determine what you can and cannot see and what the quality of the object will be. Eyepieces can range anywhere from as small as 2.5 mm to greater than 60mm. We know you’ll have a multitude of options to choose from when it comes to eyepieces, and that is why we’ve determined the best eyepieces for amateur astronomers. One thing to be cautious of however is whether or eyepiece is interchangeable across different manufacturers. Most eyepieces are diverse, but there are some made specifically for a particular brand. It’s no surprise that Celestron tops our list once again. 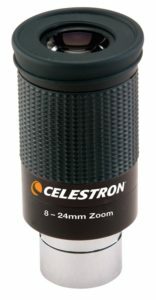 Celestron manufactures some accessories to compliment their already widely popular telescopes. Celestron’s 1.25-inch eyepiece is one such accessory that users have widely applauded. What’s great about this eyepiece that it is compatible with telescopes that accept a 1.25-inch eyepiece, so you don’t have to worry about buying from any specific brand. With a field of view (FOV) of 40-60 degrees, you’ll get crisp images of our moon and even deep sky objects. Those who wear glasses will have no problem with this eyepiece. It has a folding eyecup which allows people with glasses to lean in close. Meade’s version of the 1.25-inch eyepiece is not too dissimilar from Celestron. Apart from a slight price difference, Meade offers a similar, high-quality eyepiece compatible with telescopes that can sport 1.25-inch eyepieces. For quick and easy zooming, Meade is your maker when it comes above average atmospheric filtering and image quality. There is a small difference with the Celestron eyepiece in that the 24mm setting offers a 55-degree FOV instead of 60. It’s not the largest distance in the world, but if you’re particular about what you want to see, the Meade eyepiece does offer a slightly smaller FOV than Celestron. Of the 1.25-inch eyepieces, Orion’s Edge-On takes the cake for the highest power but with overall stats that make it one of the best in our opinion. Not only will you be able to see objects and planets with its wide FOV, but happy customers have reported being able to see the moons of Jupiter and the individual bands that give it its distinctive look. A 20mm eye relief gives it one of the most comfortable positions for those with glasses. SVBONY is not a well-known optics manufacturer, but in this case, we couldn’t resist placing their 1.25-inch eyepiece on our list. For one, the price is unbeatable. Like Meade and Celestron, it is also compatible with telescopes able to support a 1.25-inch eyepiece. Surprisingly, it sports a 62-degree FOV, slightly larger than both Celestron and Meade. This difference can mean a great deal depending on what you’re looking for, but this can give you a bigger picture of deep space beyond our moon and solar system. Altazimuth mounts are some of the more common mounts you see on telescopes today. They allow you to maneuver your telescope up and down and side to side. The loss of diagonal or full range of motion doesn’t mean you’ll be losing out when it comes to seeing objects. Advances in digital altazimuth technology have allowed users to better track objects as they move across the sky, something that previously wasn’t available to amateur astronomers. Meade has constructed one of the simplest altazimuth mounts on the market. For a reasonable price, the Coronado provides smooth and stable controls for sizable telescopes. Also, it comes with an accessory tray—can’t beat that. Since your focus will be on slow and steady movements, the Coronado employs slow motion control cables that will help prevent sudden or sharp movements. Weighing in at only 7lbs, it is portable and accessible to someone looking to take it beyond their front or backyard. Orion’s VersaGo II isn’t designed to hold the heaviest of telescopes, but it does the job. A beginner’s or children’s telescope would fit good on this mount; in fact, any telescope less than fifteen pounds is supported by the VersaGo II. Since it is one of the smallest altazimuth mounts on our list, it is also one of the simplest—allowing you to install and remove your telescope with ease. An accessories tray in the middle of the three legs gives you an accessible place to access interchangeable parts and optics. The Twilight II is perhaps the most unusual altazimuth mount because it can carry not one, but two telescopes on each of its primary mounts. In theory, you could use one telescope for normal viewing while the other could be for astrophotography. Although a little pricey, the Twilight II is an excellent investment if you have more than one telescopes with different features. The Twilight II, understandably, is the heaviest of the mounts. Weighing in close to 25lbs, it’s no wonder it’s able to sport two telescopes at once. However, if you do plan to utilize its dual telescope feature, make sure you have a stable and ample power supply nearby because they will draw large amounts of power. Equatorial mounts are rarer than altazimuth but not entirely uncommon. Two (advanced) telescopes you’ll find them on are the 80mm TwinStar Silver and the Celestron Advanced VX 8″. You’ll also commonly find them in observatories attached to much larger and powerful telescopes and peering out of the domes that house them. As far as amateur telescopes go, they are less common but provide a more stable system for tracking moving objects according to Earth’s rotation (some pretty advanced stuff!). They are also going to be much more expensive than altazimuth mounts. The CG-4 tops our list for the best equatorial mount because of its reliability and sturdiness. With equatorial mounts, the key is adjusting to the rotation of Earth, and to do this correctly, they need to be planted firmly on the ground. Celestron’s CG-4 accomplishes its goal of being strong, sturdy, and versatile as to what you can track as the night progresses. A German equatorial mount sports counterweights that are perfect for larger telescopes designed for astrophotography or prolonged exposure in the night sky. Meade’s LX70 German mount is similar to Celestron’s CG-4 in design, but on the interior, the differences begin to show. Like Meade’s altazimuth mount, the LX70 features slow motion controls for cool control over the telescope. Everything is right where you need it on the mount including the latitude/elevation controls and the accessory tray. The LX70 is also the priciest equatorial mount on our list, but on the bright side, you can attach it to any telescope twenty pounds or less. It would be a major bummer if it were only applicable to Meade’s telescopes. A steel body and frame ensures that everything is strong enough to survive a journey to an excellent location or an accidental tip over. The Min-EQ Tabletop mount is exactly as its name suggests. It’s designed for smaller telescopes weighing less than 7lbs. This equatorial mount is ideal for portability where larger mounts might be too bulky or spacious. Campground and raised platforms will be great locations to place the Min-EQ. Because equatorial mounts are rare and expensive, the Min-EQ is a bargain when it comes to price. The only problem is you probably won’t be able to mount a full-size Celestron or Meade telescope on it. However, if you do have a lighter telescope in your possession, the stability you will get with the Min-EQ will be unparalleled. Children’s or beginner’s telescopes with less bulk on the primary tube are excellent pieces to fit on the Min-EQ. Finder scopes are a useful addition to a telescope and not meant to be overlooked. Telescopes with motorized or computer tracking systems are rare and expensive, so you’ll usually find yourself using the old point and look method that astronomers have been using for hundreds of years. Finder scopes usually come in the form of a red dot sight like the ones that appear on firearms. However, these are long lasting and designed to help track far away objects as they move across the sky day or night depending on your telescope’s capabilities. What separates finder scopes from each other is how well it tracks and object and (if it has a red dot sight) if it is easily aligned. Celestron’s star pointer is a fundamental finder scope which has day and night uses thanks to the power provided from its 3V battery. 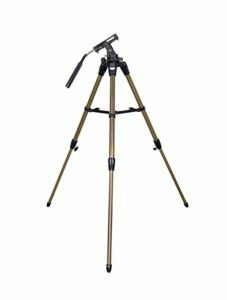 For its size and power, the Star Pointer is easily aligned with any 6-inch or larger telescope. For a meager price, you’ll get an incredible two-year warranty which is sometimes better than most telescopes that you’ll eventually attach it to. This doesn’t mean you should run wild and tossing it around like a toy, but it will protect the finder scope against most basic accidents or inconsistencies. Of the finder scopes on our list, the Star Pointer is probably one of the best all-around devices—low price, easy setup, and versatility are all hard to beat. SVBONY’s 5×24 finder scope is a classic design—a throwback to some of the early days of astronomy. This doesn’t detract from its capabilities, however, as the 5×24 has a magnification feature that is unlike most finder scopes. The 5×24 is designed to give you a level of precision that you just don’t find with other finder scopes. The screws located near the eye port allow for more accurate alignment in combination with its low power magnification. This means that not only will you be almost guaranteed to lock on to an object, but you’ll stay on it and get a proper view. Due to its versatility and power as a finderscope, the 5×24 may have more success and a more powerful telescope. It’s not pricey, but you wouldn’t put this scope on a children’s telescope that can’t see very far. Orion’s 6×30 image finder is a lot like SVBONY’s 5×24 in that they both have magnification features, with Orion’s being slightly more powerful. The 6×30 scope is shaped dif ferently than most straight facing scopes in that it is bent upward at the bottom, so you don’t have to squat down to look through a straight one. For those of us that have back problems, we know how much pain that can be! The 6×30 has a magnifying power of 6x across a 30mm diameter objective as the name suggests. These features are sure to give you a crisp, clean view of your object by way of the 6×30’s tracking and your eyepiece’s viewing power. 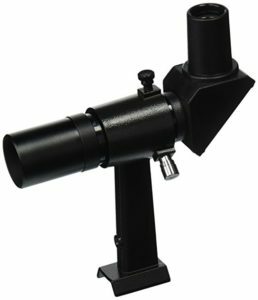 Another Orion scope makes our list, this time the more powerful 9×50 CI finder scope. As the most powerful of the scopes on the list, you’ll get one of the most enhanced looks at the object your tracking compared to all other scopes. Like the 6×30 scope, it too is made at a right angle which circumvents hunching and squatting over. Because of its shape, the 9×50 can be ideally used on a Dobsonian telescope, a type of reflector. 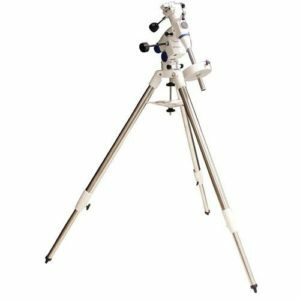 As the most expensive of the scopes, you should invest in this scope if you are looking for the best tracking and best imaging possible from your telescope. Telrad’s finder sight is one of the simpler ones on the market, but its high price will leave you wondering what makes it better than the rest of the scopes on our list. This is because the Telrad is preferred by both amateur and professional astronomers who enjoy “star-hopping” or quickly moving from one star/object to the other in quick succession. If you plan on viewing as many stars and objects as possible, then you’ll want a scope that can easily adjust to quick change of pace. Other scopes will have to be magnified and readjusted depending on how long and how closely you look at an object. The price compared to other scopes is going to put some people off, but this doesn’t mean that the Telrad isn’t capable of doing everything normal scopes do without the magnification features. A telescope filter is designed to dilute almost every atmospheric anomaly or distortion that might come between you and a celestial object. Some objects are also incredibly bright (like the sun), depending on how close they are and you’ll need a filter to see them. The set of filters that are made by Gosky do just about everything when it comes to filtering out unnecessary light. Sources like street lamps, cities, cars, and aircraft are only some examples of things that could inhibit your ability to see at night. 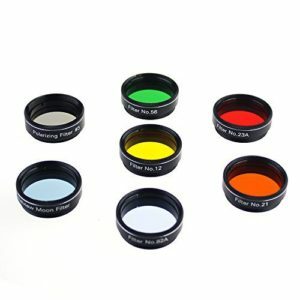 Gosky’s set of filters come in seven different colorations to enable you to see different colored planets, stars, and objects at the utmost quality.